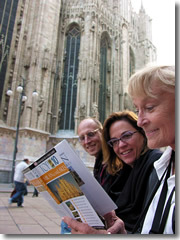 Checking out the Cathedral in Milan (I asked to take this picture because they're using one of my books; turned out to be the Parker family of The Parker Company villa rentals. Neat. ).Odds are, no matter what other reasons you have for visiting Italy, seeing the sights is somewhere near the top of the list. After all, UNESCO has estimated that some 40% of the world's collective cultural heritage is in Italy—from Roman ruins to Renaissance art, medieval hilltowns to Ferrari factories, and more museums and art-spangled churches and cathedrals than you could hope to see in a lifetime. You'll learn how daytripping can make a trip to just three cities feel like a Grand Tour of ten top destinations, and get a list of tricks and insider advice that can help save money on sightseeing. There are Top 10 lists of the best sights in Italy's major cities (Rome, Florence, and Venice—and, crucially, a cheat sheet describing which major sights you must book ahead of time and how to do so (like the Leaning Tower of Pisa, or Leonardo Da Vinci's Last Supper in Milan), and which other sights you don't have to but really should reserve ahead (the Uffizi and Accademia in Florence) to avoid hours of standing in line. Also in this section you can find links to lists of sights that are totally free of charge, and advice on using microtours (guided museum visits, city bus tours, city walking and bike tours, private guides, oddball experiences) to help you get to know a place better. You'll get the inside scoop on overloading on culture at the theater and operas—and advice on how to deal with cultural overload after a whirlwind week of Old Masters and arias. And since sightseeing brings out the shutterbug in all of us, there's also a section on tips for shooting better photos and video footage (and cameras with which to do so) so that you bring home interesting images to stimulate your memories in years to come, and not just snapshots of the family planted in front of famous monuments.